Dowel (Plus) Spawn from Mushroom Adventures. Grows mushrooms at home. Dowel spawn is used to inoculate logs and tree stumps with the mushroom mycelium. The mushroom fungus is growing on the wooden dowel. After drilling a hole into a log the dowel is inserted into the hole. The mushroom fungus grows off the dowel and colonizes the log. (Mushroom variety and log type need to be matched to ensure success.) Packets come with instructions. Instructions may be view now by clicking on instructions at the bottom of the page. 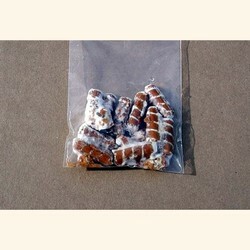 The variety pack contains 5 types of mushroom dowels. 10 Shiitake plugs, 10 Grey Oyster plugs, 10 Maitake, (Hen of the Woods) plugs , 10 Hericium plugs, 10 Reishi plugs. You may substitute any in the Variety Pack individually, if you place the substitution in the note section during check out. Be sure to note which variety you want removed and added. This packet contains 10 dowels to inoculate a log or stump. Dowel spawn is a wood dowel that has the mushroom mycelium growing inside it. It is used to inoculate dead tree stumps or logs. After drilling a hole in a log and tapping a dowel into it, the mushroom mycelium will grow from the dowel into the surrounding wood. Dowels are 5/16" diameter X 1" long.Most of the mushroom varieties grow best on newly cut hardwood or semi-hardwoods. A list of commonly used wood is included. (Most cannot be grown on Cypress, Juniper, Cedar, Redwood and Eucalyptus.) Dowels can be refrigerated for many weeks until used. Use 1-2 dowels per foot of log to be inoculated for best success. Inoculate only one type of mushroom on each log. Instructions on how to use them come with each packet.